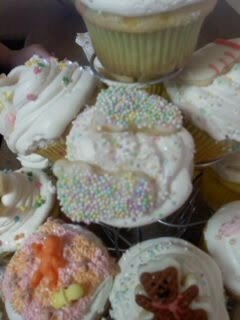 Cupcakes by Karen. She made these for me for a baby shower. Everything is edible! See that orange baby in the corner (bottom left)? Its chocolate! a choclate edible baby. The cookies were delicious. And you should've seen the cupcakes with little baby quilts on them. The time she must've spent. They make me so happy. Not only did she make these for me, but she gave extras to my kids (cookies and candy) 2 valentines cupcakes for my mom, me, Darrell and David. THEN we got these beautiful flowered ones (mom and I). Love her.